Animi-3 is a prescription vitamin supplement which includes vitamin B12, folic acid, vitamin B6, and omega-3 fatty acids. This product is used to help women maintain nutrient health during pregnancy or for patients who have a poor diet or certain illnesses. This and other drugs should be used under the direction of a doctor with a complete and current list of medications and medical history, including allergies. 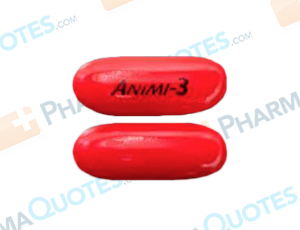 Patients who have had an allergic reaction to fish, soy, or inactive ingredients commonly found in medications may have a reaction to animi-3. Before using this product, tell your doctor if you have a personal medical history of certain blood disorders including anemias. At onset of treatment, this product can cause nausea, diarrhea, and flushing. Notify your doctor if these effects worsen or persist. Read all warnings from your pharmacist and doctor. Serious side effects should be reported to your doctor immediately, and include easy bruising or bleeding. Do not start, stop, or change the dosage of this drug without consulting your doctor. It’s important to follow manufacturer, pharmacy, and doctor’s instructions when using this and other medical products. General Animi-3 Warning: The above information is for informational purposes only and is not meant to be a substitute for professional medical advice, diagnosis or treatment. Please seek professional medical advice before starting, changing or terminating any medical treatment. Pharmaquotes is not offering medical advice, pharmaceutical recommendations or endorsing any specific prescription drug, pharmacy or other information on the site. Pharmaquotes provides no warranty or guarantee for any of the discount data, medication, or other information.